The rise of the Islamic State in Iraq and al-Sham (ISIS, subsequently calling itself just "The Islamic State" since the Caliphate declaration of 29 Jun 2014) across Iraq and Syria will naturally provoke much questioning as to how this phenomenon came to such prominence. Overall, this book ably accomplishes the task in a concise manner, and is a valuable, compelling read for anyone- general reader or specialist- interested in ISIS. While minor errors exist here and there and one might disagree with some of the authors' analysis in the detail, the book is extremely well-researched, drawing on an array of sources including much original interview testimony, and the overall conclusions that emerge are hard to contest. The authors begin by tracing the history of the most important forefather of ISIS: Abu Mus'ab al-Zarqawi, including his early years in the Afghanistan-Pakistan (Af-Pak) area in the closing days of the Soviet military presence in Afghanistan, his journey home to Jordan by 1992 and relationship with jihadi intellectual Abu Muhammad al-Maqdisi that culminated in his imprisonment, and his subsequent return to Af-Pak in 1999 that first saw signs of tensions between Zarqawi and al-Qa'ida leader Osama bin Laden (OBL), where he nonetheless secured an alliance of convenience and ran a training camp in Herat, Afghanistan. Following the invasion of Afghanistan, Zarqawi forged another alliance of convenience with Ansar al-Islam in Iraqi Kurdistan, moving there and throughout the region via Iran before his firm establishment on the scene of the Iraq War in 2003 with his Jamaat al-Tawhid wa al-Jihad and subsequent allegiance to OBL as the affiliated al-Qa'ida in Mesopotamia/Iraq. Where appropriate, Weiss and Hassan are keen to draw analogies in Zarqawi's history and strategy with the present-day approach of ISIS, such as the same genocidal attitudes towards Shi'a designed partly to provoke murderous counter-responses and draw Sunnis further still towards the notion of Zarqawi/ISIS as 'protector of Sunnis', so to speak. Indeed, one cannot really overstate the link between Zarqawi and ISIS, but it might also be worth noting that the tensions between OBL and Zarqawi (despite OBL's acceptance of Zarqawi's allegiance) and ISIS' break from al-Qa'ida do not stop ISIS today from attempting to appropriate OBL as one of their own, as well as the likes of Abdullah Azzam. 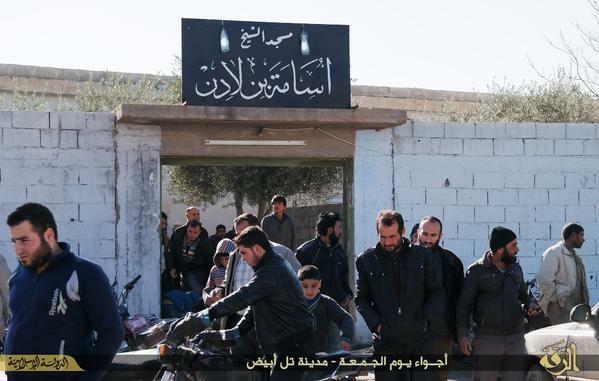 The ISIS-run Osama bin Laden Mosque in Tel Abyad, Raqqa Province. ISIS also runs at least one school and training camp each named after OBL. Another analogy drawn is the issue of tactical alliances between Zarqawi's men and Ba'athists and between ISIS and the latter today in the form of the Naqshbandi Army (JRTN). While JRTN and ISIS did cooperate in events such as the fall of Mosul in 2014, a significant difference now as opposed to the years of the Iraq War is the much greater dominance of ISIS, which meant that JRTN was in effect more trying to ride the wave of the ISIS-spearheaded offensives rather than there being a relationship of essential co-dependence between the two groups. This is why ISIS very quickly asserted itself as the dominant power in areas such as Mosul at the expense of the likes of JRTN, able to impose its most draconian measures and establish its 'diwans' (government departments) despite JRTN's objections. Indeed, the concept of "tactical partnering" with JRTN that is mentioned elsewhere is something liable to be overplayed. A more original contribution deserving great credit is the rightful attention drawn to the jihadist text Idarat al-Tawahhush ("The Management of Savagery") by Abu Bakr Naji in 2004 and its importance to both Zarqawi's ilk and ISIS today as a means to justify acts of brutality in the context of jihad. The authors then trace the local sparks in areas such as al-Qa'im (on the border with Syria in Anbar province) in 2005-6 where Zarqawi's AQI had overplayed its hand that would help give rise to the coordinated Sunni Sahwa movement in Iraq by 2007 against what had by then become the Islamic State of Iraq (ISI), which had emerged after Zarqawi's death as an official umbrella including the AQI front-group Mujahideen Shura Council (MSC) in early 2006 that had been created in a bid to give Zarqawi's outfit a more Iraqi face. At the same time, the problems that had been created by sectarian Shi'a militias and their human rights abuses as well as Iran's not stopping the flow of al-Qa'ida operatives and funds through Iranian territory are not disregarded. The authors also correctly identify traces of what would become the formal split between ISIS and al-Qa'ida in the deliberately ambiguous relationship maintained by ISI with al-Qa'ida during the years of Abu Ayyub al-Masri/Abu Hamza al-Muhajir and Abu Omar al-Baghdadi (2006-2010). For al-Masri, who officially subsumed the MSC under Abu Omar al-Baghdadi's ISI, "was indeed trying to have it both ways: to remain the amir of AQI while also flirting with outright secession from it to command his own independent operation" (p. 291), bolstered by the pretensions to statehood in the name of ISI and its self-declared ministries. Much of what follows on the U.S.-troop surge and the rolling back of ISI by the Sahwa in coordination with coalition forces is history that has been extensively discussed and need not be reproduced in too much detail, along with the marginalization of the Sahwa movement and Iraq PM Maliki-led crackdowns on Sunni politicians in the face of the U.S. withdrawal from Iraq that sparked the Sunni Arab protests in 2013, going right up to the fall of Fallujah at the beginning of 2014. One could argue for some differences in interpretation here. For instance, while it's certainly true Iran played an important role in bringing together the second Maliki-led government as the authors note, it is questionable whether Ayad Allawi and his Iraqiya-bloc could really have engaged in successful outreach to the other Shi'a political blocs to form a coalition. Further, the coverage of Maliki's response to the 2013 protests does not mention that he allowed for political concessions to be drafted by deputy premier Saleh al-Mutlaq and to be put to the parliament. The fact these reforms died in the parliament points to a broader failing on the Shi'a political spectrum to address Sunni grievances such as de-Ba'athification. The book- now at chapter 7- then reverts in chronology to discuss in detail the Assad regime's extensive collaboration with jihadis during the Iraq War in facilitating the influx of foreign fighters into Iraq via Syria, as well as the regime's complicity in terrorist attacks aimed at destabilizing the first Maliki government. Chapter 8 discusses key personalities in ISI and its successors under the tenure of Abu Bakr al-Baghdadi, including a profile of the leader himself. Usefully correcting press reports that suggested Abu Bakr was released from the U.S.-run Camp Bucca prison facility in 2009, the authors rightly note that his time in Camp Bucca was only in 2004, while also citing journalist Wael Essam who points out Baghdadi's stint in the Salafi group Jaysh al-Mujahideen (which would be in 2005, besides founding his own Jaysh Ahl al-Sunna wa al-Jama'at in 2003) prior to his involvement with ISI. Other figures profiled include Abu Ayman al-Iraqi and Abu Ali al-Anbari, both former officers in the Saddam regime's armed forces, and Abu Omar al-Shishani. On the subject of Shishani, some corrections need to be made. He did not first emerge in Syria in 2013 (p. 535) but 2012. Further, Shishani actually pledged allegiance to ISIS in May 2013 and thus became ISIS' 'northern' amir for Syria, which is why his Jaysh al-Muhajireen wa al-Ansar (JMWA) outfit over the summer of 2013- including the fall of Mannagh airbase- was described as affiliated with ISIS. A split occurred in the ranks in late November 2013, whereby some in JMWA would not pledge allegiance to Baghdadi because of a prior oath to the Caucasus Emirate, marked the split whereby Shishani and his loyalists dropped JMWA labels and solely became ISIS, while the remnants continued the JMWA name and banner under a new leader. All that said, the authors are right to point out the way in which Shishani's persona has been hyped somewhat by sensationalist Western media coverage- something that can be said for coverage of ISIS more generally. Chapter 9 onwards deals with ISIS and the history of the Syrian civil war, and it is in these parts where the authors' most original contributions shine, relying on testimony from an array of ISIS members undoubtedly thanks in good part to Hassan's extensive connections in eastern Syria, much of which is now under ISIS control. The authors draw a particularly nuanced and insightful picture in their various categories of ISIS recruits: for example, one category are those "who already held Islamist or jihadist but had limited themselves to only orbiting takfiri ideology [NB: the practice of declaring other Muslims apostates to be killed]. The final gravitational pull…differed depending on circumstance" (p. 667). Thus some joined because ISIS overran their territories, thus being the only horse to back, others were impressed with ISIS' resilience and successes against rival rebel groups, while others had disputes with their original group affiliations and found ISIS a better organized, disciplined and capable body. Contrary to what might be supposed, this tendency to defection was already under way during ISIS' early months inside Syria, most notably when Islamist groups issued a statement rejecting the opposition-in-exile (the text puts this as September 2014; actually 2013- a simple typo- p. 669). The authors also note in this context of ISIS recruitment how ISIS' emphasis on global conquest takes a sharp swipe at other Salafi-Jihadi and Islamist brands, including Jabhat al-Nusra (JN: Syria's al-Qa'ida affiliate), that try to steer clear of the notion. Indeed, in agreement with Weiss and Hassan, it must be noted how little JN has until 2014 talked about notions of establishing the transnational Caliphate, with hints of it generally coming from unofficial footage and testimonies from its foreign fighters. In light of that, the authors' characterization of JN as having positioned itself somewhat "as a 'nationalist' outcropping" (p. 673) makes perfect sense. Other subtle categories of ISIS recruits noted by the authors range from those supporting ISIS as a political project- such as Arabs in Hasakah province who see ISIS as a bulwark against Kurdish expansionism (a serious dynamic often overlooked)- to opportunists such as Saddam al-Jamal, who originally commanded the local Supreme Military Council affiliate in the town of Albukamal on the border with Iraq before defecting to ISIS. Weiss and Hassan further document in considerable and revealing detail how ISIS has been able to co-opt tribes in eastern Syria. Everyone by now knows of the Shaitat tribal uprising in Deir az-Zor province against ISIS in August 2014, but less observed is the fact that ISIS got members of the same tribe to put down the rebels by brute force (p. 842). ISIS' divide-and-rule strategies for individual tribes- together with its ability to act as mediator between other tribes- severely complicate efforts to stir a tribal backlash to roll back ISIS in the heart of its territories. The final chapter (ch. 14) deals at great length with ISIS' running as a supposed state, with much new information to contribute. For instance, the "separation of powers" where those with various specialties affiliated with ISIS (whether a cleric, military commander, those in public services) do not know precisely what the others do or know, helping to protect against infiltration (pp. 865-6). The authors do not gloss over ISIS' harsher aspects of governance such as torture of detainees but in the case of the town of Manbij in Aleppo province- currently controlled by ISIS- it is clear there has been much local sympathy for ISIS as its rule stamped out lawlessness and corruption. This is one big advantage ISIS has in competing with other rebel groups: in offering a single-party model of governance in the context of years of ongoing civil war that will, inter alia, promptly answer complaints from a local about another person, apply its laws to its own members, disarm local communities etc., ISIS can bring a sense of order that Syrian rebel groups can't. Indeed, as the ISIS Ajnad Media nasheed "The Shari'a of Our Lord" puts it, ISIS' rule can indeed bring a "life of security and peace." In the realm of public services and economics too, ISIS' public advertisement of itself- at least in Syria- has not been wholly divorced from reality, such as in forcing municipality personnel to work in contrast to prior groups that allowed them to receive salaries from the state while doing nothing (p. 952), while also introducing price controls on commodities such as oil by-products (p.954). The book's epilogue offers a number of spot-on conclusions. First, one must be wary of Iran and the Assad regime's presentation of themselves as the solution to the ISIS phenomenon, as their own repressive approaches towards the original Syrian uprising especially have helped contribute to the problem. Iran in particular, with its ongoing strategy of cultivating sectarian proxy militias in Syria and Iraq that employ brute force, can only be seen as aggravating the situation, even as notions of cooperation with Iran amid the context of striking a grand bargain over the nuclear deal become ever more prevalent. Second, the ISIS split from al-Qa'ida, far from being a case of a 'let them fight each other and engage in jihadi blood-letting' bonus, actually presents a threat to the West as the two brands may look to compete as to who can pull off the better attack on Western soil. Finally, when all is considered in the analysis, recent reported local gains against ISIS, such as in pushing the group out of the city of Kobani, or scoring hits with killing prominent members or destroying convoys in coalition airstrikes on ISIS, do not change the fact that ISIS has been ruling for quite some time the heartland of its territories and most important strongholds, from Manbij and al-Bab in Aleppo province to Mosul and Tel Afar in Ninawa province, without any significant local rivals to challenge its power. There is no extensive ground force analogous to the U.S. troop presence at the height of the Iraq War to help coordinate local Sunni forces to 'roll back' ISIS this time around. ISIS has a well-known official slogan: baqiya wa tatamaddad ('remaining and expanding'). ISIS may not be tatamaddad so much these days, but it is certainly baqiya now and for the foreseeable future.